In reaction to news of my cousin’s accident last week, I mentioned how challenges make it difficult to function and maintain focus on our goals and values. As there’s no major news regarding my cousin’s condition, I’m continuing to think about how we stay grounded in the wake of life and all its complexity. As I’ve noted before, one of my grounding activities is yoga. With few yoga classes here in the Eastern Ontario countryside, I currently follow a TV yoga program on ONE called Namaste by Kate Potter. Despite the intrusion of commercials (which I’m now able to drown out as I just continue the poses on my own), the set TV schedule forces me out of bed and I actually follow it consistently. I am not very advanced, and I’ve only lately become more consistent, but already I see so much value for myself in keeping a regular practice. Yoga is difficult, physically. But there’s also a mental challenge. “Yoga is a practice that requires both effort and letting go of the results of that effort” (Kate Potter, Namaste Yoga). It’s counter-intuitive as you’re struggling, sometimes with very little joy, to hold your body in postures it wouldn’t naturally assume. Why the effort if it doesn’t matter what happens? But I think the detachment is about finding pleasure in the effort–doing for the sake of doing–which helps you put your whole self into it. There’s no “finally, I have mastered this.” It’s a continual effort to improve physically and spiritually, where the goal is just to do. And with that steady effort, there are breakthroughs. Through the many years I have practiced yoga on and off, I have always been mystified by “crane” pose. With your body kind of scrunched into a ball, you lean your knees onto the backs of the arms and put the weight forward, balancing on just the hands. I would always tip back, slide off my arms, or crash forward. But then one morning, it just worked. I ran upstairs and woke up my husband who feigned some enthusiasm despite not really knowing what I was babbling on about. No matter, I was happy! There are physical rewards–more energy and flexibility, for example. I even feel I look better when I’ve been doing yoga consistently (and if it’s just in my head, I’m fine with that!). There are also mental rewards. Yoga is meditative, with an inward focus on the feeling of the body and the breath. There is grace in yoga–it highlights beauty in the human form. Of course, sometimes you’re sweating profusely or squished over, revealing the accordion of extra skin in your midsection that you try to deny the existence of. But in many postures, looking down the length of my arms, muscles in impressive relief and my fingertips tickling the air in front of me, I imagine myself weightless like a bird gliding through the air. At those moments, I truly feel beautiful (stomach rolls and all). 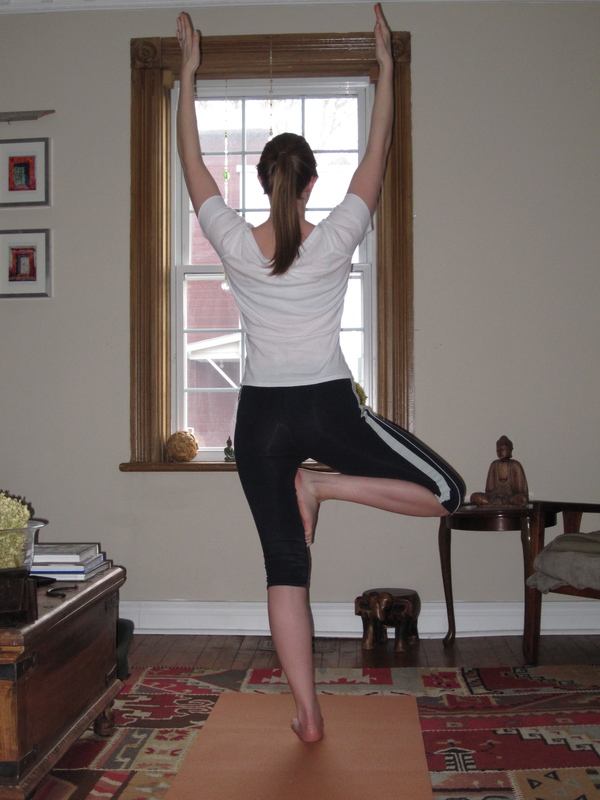 Tree Pose–another work in progress! And the particular challenge of yoga that asks you to let go of the results gives you freedom just to try, letting go of self-judgement. When I wrote about the connection between procrastination and perfectionism, this was at the crux of it. Self-judgement can be crippling. To move forward and achieve things, we have to let go to of that inner critic and just work, even if it means failing sometimes. That confidence on the mat spills over into the rest of the day. As I balance in tree pose, instructed to feel my muscles as roots grounding me into the Earth, I gain a lasting steadiness. I don’t have a special yoga room. I move my coffee table over every morning and roll my mat across the living room floor, while my husband and dog are still asleep. One morning, I looked up and saw little rainbows dancing on the wall near the ceiling. 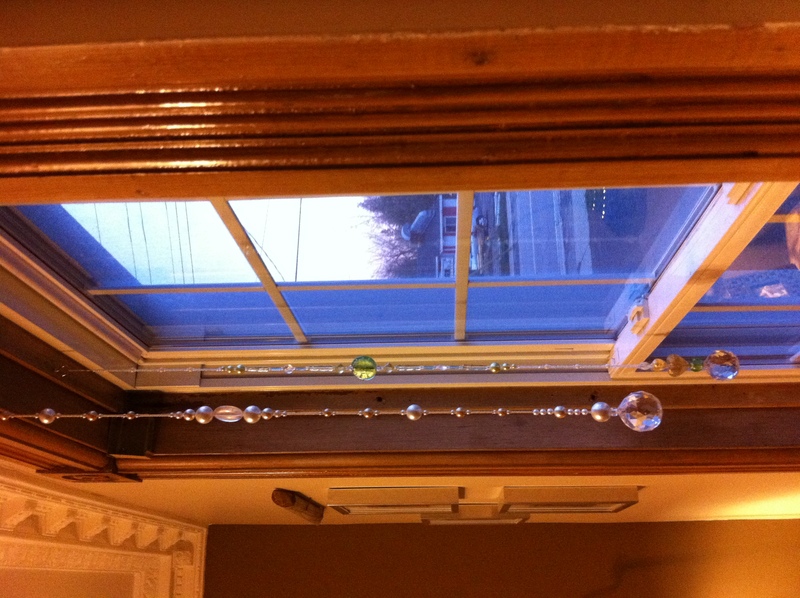 This was the one time of day, I realized, when the sun streaming in the window reflects through the crystals that my sister Kirby made for me. It’s especially appropriate since Kirby was very dedicated in her practice, and I feel close to her when I do yoga. With those little rainbows watching me in the morning, I almost feel like she is there. Good to hear from you again. Your take on yoga intrigues me. I like that you follow the show when it appears…that’s discipline. Nice pictures. That sounds magnificent! Kirby always tried to make me love yoga. I did it a few times with her but never caught the bug. With your description above, I’ll be giving it another try! And Logan is in my thoughts- as are you, my sista’. Hopefully you’ll get into it. My experience is that some classes and styles are very different and you need to find one that really works for you. Pilates is also a good choice if you want something a bit more fast-paced or rigorous but with similar benefits.